Just for Fun – Pickle Pops! I am a HUGE of fan pickles. They are an ideal snack: crunchy and salty with built-in hydration (aka juiciness) and low-calorie enough to allow for mindless munching. So, I was intrigued when I read James Oliver Cury’s review of Bob’s Pickle Pops on Shine.com. These funky finds are frozen pickle juice pops on a stick. Haven’t tried ‘em yet myself, but I will as soon as I run across one in the mini mart or grocery store. 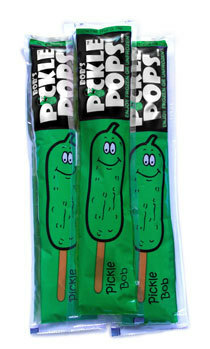 Newsy Note – Bob’s Pickle Pops were originally called PickleSickles. They had to change the name, though, because Popsicle was concerned about how similar the two names sounded, and they wanted to protect their trademark. Nutty! Entry filed under: food review, news around the blogosphere. Tags: fun and funky.